Join HACCP Training and Get HACCP Certification! HACCP (Hazard Analysis of Critical Control Points) is a management system in which food safety is addressed through the analysis and control of biological, chemical and physical hazards. 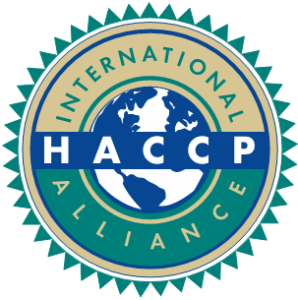 HACCP provides systematic approach to these hazards that can cause your food to be unsafe and designs measurements to reduce these risks to a safe level. HACCP system is critical to your compliance with national and international legislation. The HACCP system meets the requirements of the Codex Alimentarius Commission established by FAO and WHO to set codes of practice and internationally recognized standards pertaining to food, food production and food safety. The Commission’s main goals are to protect the health of consumers and ensure fair practices in the international food trade. Having well functioning Food Safety System is a must for companies that want to stay competitive on the market. It can also be used to fulfill governmental requirements (FDA / USDA) and to support the requirements of GFSI standards such as SQF, BRC or FSCC 22000. New FSMA law requires companies to have PCQI (Preventive Control Qualified Individuals) on staff. These employees are responsible for overseeing and maintaining Food Safety Systems and Pre-requisite Programs. In order to be a PCQI an individual must obtain proper training. HACCP is a pre-requisite for PCQI training. Another words, individuals who want to become PCQI at their company must first obtain HACCP certification. BD Food Safety Consultants can help you meet your training needs. Please visit our HACCP training tab to sign up for the upcoming class. Hello! Someone in my Facebook group shared this website with us so I came to give it a look. I’m definitely loving the infnamrtioo. I’m book-marking and will be tweeting this to my followers! Exceptional blog and brilliant design.